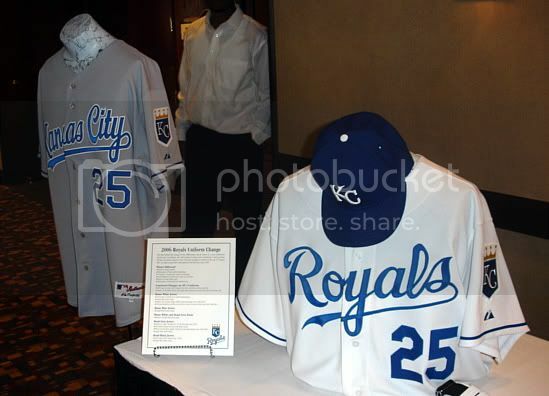 RC correspondent Chris Ray was on hand this afternoon at the annual Royals Forecast Luncheon, and he's been kind enough to provide us with some details and photos. Much of what he reported has already been touched upon over at Royals Authority, so we highly recommend you check it out. Anyway, on to our report. Perhaps the most encouraging news of the afternoon was John Buck's report on the Royals minicamp, which was held a little over a week ago. Buck said that Zack Greinke and Andy Sisco were throwing great. He said Sisco seemed to be throwing even harder than last year, and Greinke had "body and mind" in sync far better than last year. Both pitchers have been working extensively with new pitching coach Bob McClure, and Buck said Greinke has really been taking to his new coach. Allard Baird had a few comments on players as well. He said Andres Blanco and Justin Huber will head back to the minors to start the season. Blanco's defense clearly needs no improvement, but the Royals want to see better offensive production out of him before bringing him back up. The opposite is true of Huber. Baird said his offense is close to Major League ready, but he's returning to Omaha to work on his defense. On Billy Butler, Baird said he wants him to get a full year under his belt playing left field, and he'll most likely return to Wichita to begin the season. Baird also mentioned that they've had Elmer Dessens throwing a lot of innings in winter ball so he can build up his stamina for the World Baseball Challenge. Since he's going to be a starting pitcher for Mexico, the Royals wanted to minimize his injury risk, so they want to make sure his arm is ready to handle the increased pitch count. He's now back in Arizona. In fact, Baird was also grilled a little bit about organizational pitching injuries. Indeed, the perception is that the Royals have a lousy track record in keeping their young pitchers healthy. However, Baird pointed out that the Royals have analyzed the problem, and they've concluded that perception, in this case, is not reality. In fact, the Royals have suffered an average number of pitching injuries when compared to the other Major League clubs. Of course, Baird said that still isn't good enough, and they're constantly searching for ways to keep their pitchers healthy. He mentioned that to this end, the Royals send many of their pitcher to biomechanical centers, where they fine tune their mechanics to avoid injury. It's definitely a step in the right direction. When talking about the proposed stadium renovations, Dan Glass said that if they pass, the Royals should be in "heavy consideration" for an All-Star game in the future. He said both he and his father were swayed to support renovations -- rather than a new downtown stadium -- largely because of the amount of fan feedback and sentimentality for Kauffman Stadium. When David Glass spoke, he announced that after today, he'll never again discuss the disastrous 2005 season, and that he'll do whatever he can to win in Kansas City. 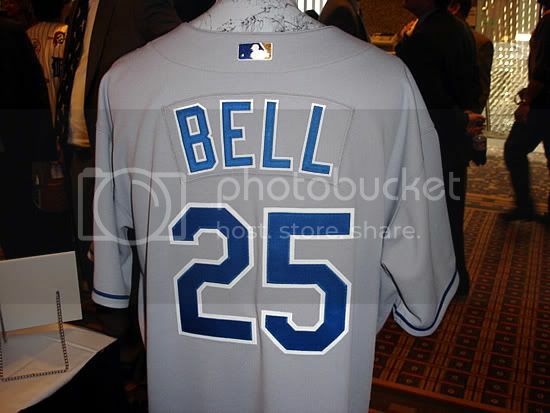 And of course, the Royals finally unveiled their new uniforms. If you've been reading RC, this is somewhat anticlimactic, but it's still pretty cool to see the actual thing. 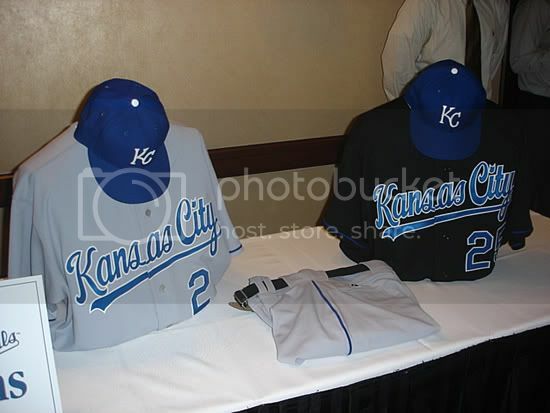 Ray snapped several photos of the new uniforms, presented below. 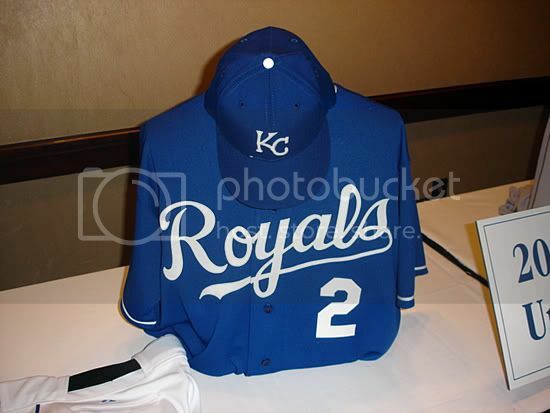 There has been some question about the color of the blue script on the road uniforms -- some of the photos make it look like a lighter shade of blue. However, this is merely a reflection caused by the camera, as the actual color of the script is the same Royal blue as always. A special thanks goes out to Chris Ray for the great work he did today at the luncheon, and for his work on exposing the new uniforms. 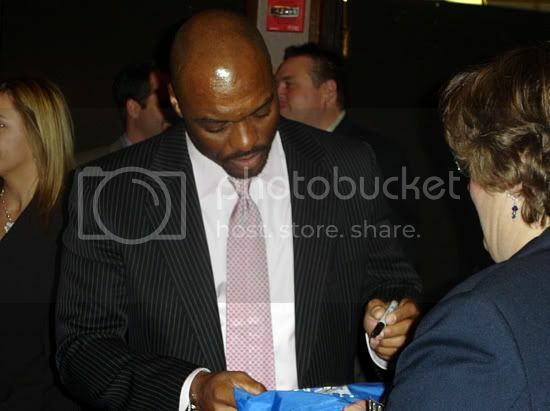 Since he first heard the Royals were changing their uniforms back on May 19, 2005, Ray has been relentless in his quest for information, and today confirmed, once and for all, that everything he dug up for RC was 100 percent accurate. While we're dishing out optimism, RC has a special treat for you. The offseason can be a pretty depressing time for us, so to keep our spirits up, RC frequently looks through the vast catalogue of photos we took last season. Anyhow, we recently uncovered two previously unpublished photos to share. The first is a photo from the California/Carolina League All-Star game we attended in June. As you know, RC was on hand for the home run derby prior to the game, where we saw Billy Butler put on one of the most impressive power displays we've ever seen. Butler sprayed HRs all over the field, and he hit several balls completely out of the stadium. However, the most impressive homer was one that didn't quite make it all the way out. 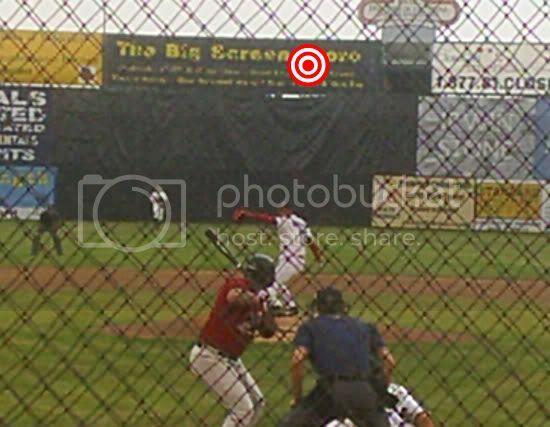 The target on the photo below represents the approximate spot where the ball hit. The outfield wall in Frederick is actually two walls. The tall wall sits back several feet from the lower wall, which is 400 feet away from home plate. Anything over the lower fence is a HR. Butler's blast nearly cleared both walls in DEAD CENTER FIELD, and it bounced off of the "Big Screen Store" ad. In addition to that monster shot, Butler also hit one completely out of the stadium just to the left of that yellow sign. RC only wishes we'd had video capability back then. Butler's power is unbelievable, and it's only going to get better as he gets older. Hopefully those thoughts will get you though the weekend, as time seems to slow down as baseball season approaches. 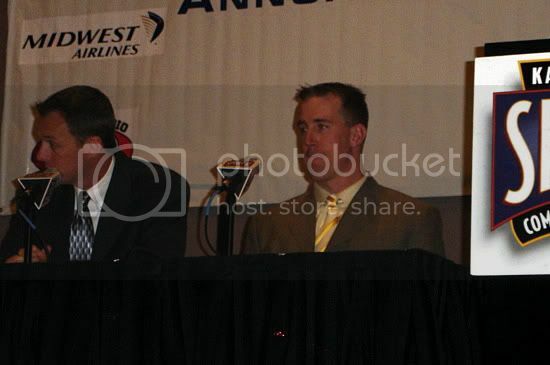 I am wondering what Buck is talking about with Greinke concerning being in sync and body and mind approach. I guess maybe he's just working really hard or something. Good to hear, we need a good season from Zack. The new road grays are the best road jersey in MLB. 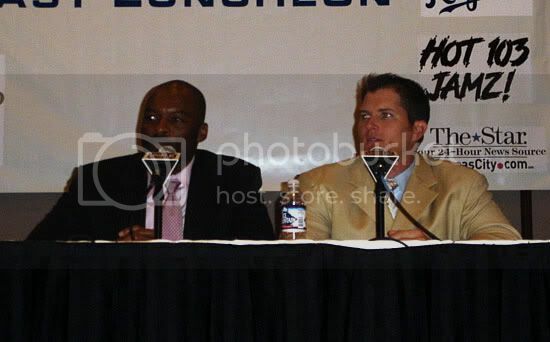 Great to hear McClure and Greinke are off to a good start! I take Buck's comment to mean that Greinke may have been thinking too much and trying to do too many different things last year, and now he has a clear head and is throwing well. We'll see if he's the type of pitcher to overthink and get roughed up when things go wrong or if he can trust his stuff and work his way out of slumps and keep them from prolonging. "I guess I didn't realize that D Murph was overweight last year..."
Exactly right. I don't recall anybody griping about his size last year. I take that whole gain/lose weight thing with a grain of salt. If Grimmace or Pickering were to lose 20 pounds, now you're talkin'! RC is ready for 2006!